St. Blasius (Vlaho) is to Dubrovnik what St. Mark is to Venice. The feast of St. Blasius, the Patron saint, is observed every year on February 3, and it is the true feast of the whole city. 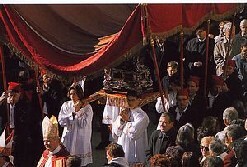 It is known far and wide for its pageantry and participation of people from neighboring villages in their picturesque costumes, for its majestic procession in which the relics of the Saint are carried, and for popular events and merrymaking. In the times of the Republic it was a custom seven days before the feast and seven days after it to release from jail prisoners who were not dangerous, and anyone who was permanently banned from the city could come back for the festivities. 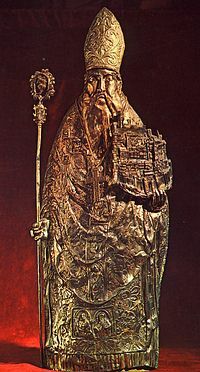 St. Blasius was bishop of Sebasta in Armenia, he suffered martyrdom under emperor Diocletian and became patron saint of Dubrovnik in the 10th century. It seems that he appeared in a dream to one Stojko, rector of the cathedral, and warned him that the Venetians, anchored near the island of Lokrum, intended to attack the city that night. 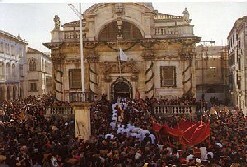 After the Senate had meticulously checked Stojko's report St. Blasius became the patron saint of the city of Dubrovnik. His statue was carved on all fortresses of the city and above all gates of Dubrovnik. 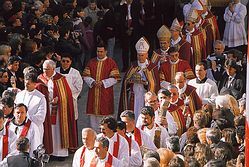 St. Blasius also adorns the flag of the Republic, and the figure of the bearded bishop with mitre and pastoral staff appeared on all official seals of Dubrovnik and on coins minted in Dubrovnik.